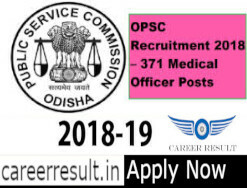 Short Information : Odisha Public Service Commission (OPSC) has published a jobs notification for the OPSC Recruitment 2019 for filling up 371 vacant posts of Ayurvedic Medical Officer (221 Posts) and Homeopathic Medical Officer (150 Posts). Applicants should apply for OPSC Recruitment 2019 Online Form as soon as possible. To get more details of OPSC Recruitment 2019 like Education Qualification, Age Limit, Selection Process, Important Dates/Events & other recruitment rules are given below…. Candidates must have Bachelor’s Degree in Ayurvedic Medicine and Surgery (BAMS) or equivalent degree from an University or Institution recognized by the Central Council of Indian Medicine. Applicant must have a Bachelor’s Degree in Homoeopathic Medicine and Surgery (BHMS) or equivalent degree or Institution recognized by the Central Council of Homoeopathy. In this OPSC Recruitment Process the Selection of the candidates will be based on Written Test (Objective Type- Multiple Choice Questions) & carrier Marking. Interested and qualified candidates may apply online against to Odisha PSC Bharti 2018 by login to the official website of Odisha Public Service Commission i.e. www.opsc.gov.in or www.opsconline.gov.in from 14 December 2018 to 14 January 2019. For more detailed info regarding to OPSC Recruitment Online Form 2019 kindly visit official website and read carefully employment advertisement before applying against to OPSC Vacancy Online Form. Subscribe Careerresult to get latest updates about OPSC Medical Officer Vacancy Online Form 2019 on your smartphone via E-mail. For more latest jobs updates in Medical Jobs Stay connected with us.All candidates have to request is to share this job link with your friends over at Whats App, Facebook ,Twitter,Instagram and help them get good career in your life.